hi i see she takes the temp. the only thermometer i have is a candy one will that do? sorry forgot to ask i don’t i have any shea. what other butter can i use.i have mango,, avocado & deodorize coco butter will one of these do? hi could i use green tea extract in place of mallow? Potassium Cocoate can be replaced with another surfactant? There I have it. Thank you! You can also use a liquid soap in place of the potassium cocoate. Liquid soap will give this scrub cleansing and lathering properties like the potassium cocoate does! can i use sea salt instead of sugar ? Is there a way to re moisten it once it’s been made and put in jars? I made this scrub and enjoy it, but was wondering how to make it less hard or dry? I am not sure if I should add more or less of something or maybe make a different scrub instead. Is the mallow extract essential? I’m assuming it’s to help with keepng the skin moisturized? Can it be substituted with something else? Thanks! I made these for the holidays, but I didn’t have blue jojoba beads. I used red and scented it with peppermint FO, and green with Fresh Bamboo FO. Everyone loved them, and it was easy to change the beads and FO. Thank you for such a great recipe! It doesn’t appear as if you are using an emulsifier in this recipe to combine the liquid soap with the oils, however, as you are mixing it does appear to stay together. How is this so if the mixture is water and oil? You are correct, this recipe doesn’t use an emulsifier! The reason it stays together is because the soap and oils have a similar texture. While water is used to make the potassium cocoate, which has a similar texture to liquid soap, the end result is a liquid soapy texture. When making soap, the oils react with the lye and water to create soap. I’ll include a blog post with more information! Ah, got it. I didn’t realize that. Thanks for the info! You can fragrance oil to the scrub after the sugar and jojoba beads have been added. It will definitely take a little elbow grease to get it all stirred in though! Does this make a bubbly scrub? I am looking forward to making this, and I love Karen’s idea of using citrus EO. I am planning on giving this for a Christmas gift as part of a “Spa Pack”, and I think iw will be a winner. I have been making my own potassium cocoate, and am thrilled to have another recipe to try it out on! That sounds like an awesome idea! A spa pack would be such a fun gift. I would like to use citrus essential oils (such as a mixture of Orange Valencia and Grapefruit) instead of the Rain fragrance oil. Would it work to use orange peel powder as an exfoliant instead of jojoba beads? If so, how much would you recommend adding? Orange peel powder creates a great orange color and offers very gentle exfoliation. You may want to try adding the same amount as the jojoba beads and giving it a try to see if it’s scrubby enough for you. Is it safe for your face? I want to make this to gift friends with but wanted to ask first, what’s the shelf life for this product? 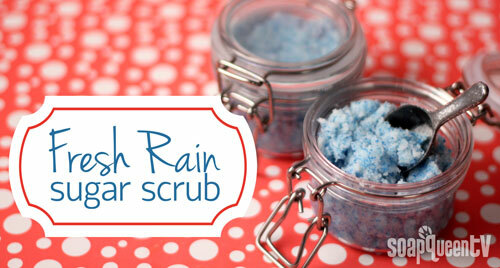 Oh, thank you for this new recipe for a scrub! It’s so pretty and I am new to the Potassium Cocoate product. I cannot wait to make this…it sounds like it will smell lovely. 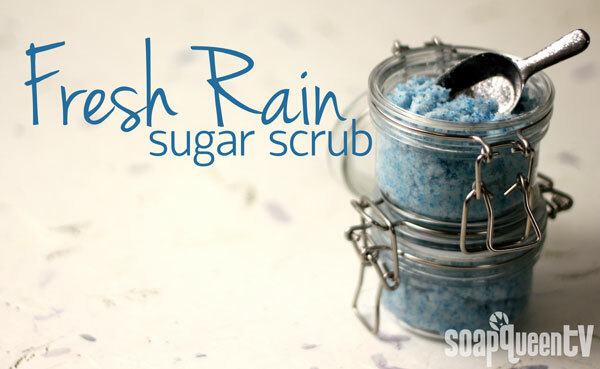 Like this recipe with the soap…Yeah, I’d love to see this scrub in use too! Sounds like a great new product recipe. I would have loved to see this scrub in action as a demonstration of it’s use at the end of the video. The jojoba beads add that nice touch of color.